I’m not sure where I first tried tiramisu, but I suspect it was at some place like Macaroni Grill. 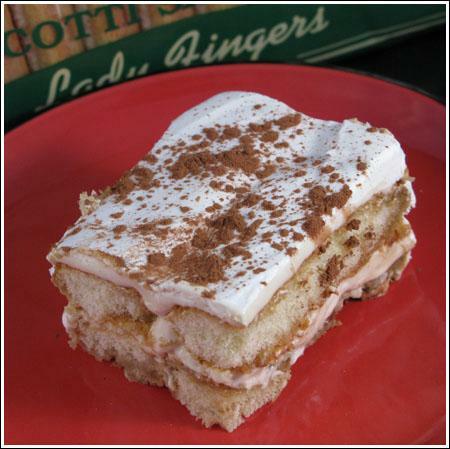 There’ve been so many tiramisus at so many places since then, it’s all a big blur. And frankly, I’ve had enough bad tiramisu that I’m leery about ordering it out anymore. I’d much rather make it at home using this tried and true recipe which just so happens to be from Cooking Light. It’s called White Russian Tiramisu, and while it’s not actually authentic (no marsala, no eggs), it’s delicious and much less dangerous to have around the house because everyone knows there’s no such thing as “one bite” of tiramisu. But back to authenticity. Mine is even less so because I put “Cool Whip Lite” on top. If Francis Ford Coppola comes to dinner, I’ll take the Cool Whip out, but I like the fluffiness it adds and the calories it takes away. Besides, it kind of dilutes the overall calorie count and makes you think you’re getting more than you are. You can even use Fat Free Cool Whip. Other than that, I follow the Cooking Light recipe as written, but use a .7 oz package of Alessi brand hard-type ladyfingers. They soften up in the refrigerator. I adore Cooking Light recipes. I haven’t tried this one yet, but if it has your approval I’ll take to whisk ASAP. That’s a really good looking light version, and I have no beef with Cool Whip! I noticed that the CL Recipe says there are 12 servings in an 8×8 dish–not for my greedy appetite:) Even cut into 6 servings, the calories would still be low. Anna, thanks for the comment! Glad there’s another Jeopardy fan around. Cakespy, this one is very light. The fat free cream cheese brings the total way down. Maggi, thanks for that link! I’m going to check it out. Swissmiss, I’d love to hear what you think about this one. In my opinion, this one is better than a lot of the high fat versions. Jen, I followed the directions in the recipe using the suggested ingredients, but I put whipped topping all over the top. Sometimes I fold about a cup into the cheese mixture just to mellow it out. It’s pretty tangy. Hi. This looks wonderful. Just to clarify – did you use cool whip lite instead of the cheese mixture? Or in addition to the cheese mixture? Thanks! I love tiramisu!! Don’t shoot me, but that’s one of the few things I LOVE at Maggianos. (uh oh… here we go). I’ve made it a couple of times in the full-fat mascarpone version, and let’s just say that I could feel my pants getting tighter by the end of the week! Thanks for the review and lovely pic of the low-fat-cal version. It’s in the “to try soon” file! Yum! I love Tiramisu but sometimes it is even too heavy for me!! I like this lighter version.